When people use the word “fanfare” to describe celebrations, they usually mean it metaphorically. But there were literal brass instruments, bells up and held high, at the official opening of the Shed on Friday night. 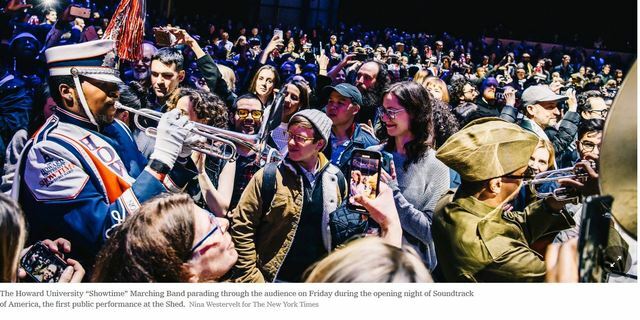 The first public performance — inside the cavernous McCourt space at the new arts center, one of the most ambitious and high-profile additions to New York City’s cultural landscape in years — began with a marching band exuberantly parading through the audience. It was the start of Soundtrack of America, a five-concert series paying homage to the history of African-American music, conceived by the filmmaker and artist Steve McQueen. He and Quincy Jones watched from the sidelines as the instrumentalists made their joyous entrance. Nearby was Alex Poots, the Shed’s artistic director and chief executive, pacing on the periphery. He was witnessing not only the inauguration of an institution more than a decade (and $475 million) in the making, but also of the programming he has been developing since he joined in 2014. For the Shed’s first weekend, he had commissioned “Soundtrack for America,” as well as the interdisciplinary “Reich Richter Pärt,” new work by the artist Trisha Donnelly and the play “Norma Jeane Baker of Troy,” starring Ben Whishaw and Renée Fleming. There was a preview of “Reich Richter Pärt”; afterward, Steve Reich said in an interview that he was happy to finally hear his score with a large crowd, and not in the acoustics of an empty room. He was there again for the piece’s first public performances on Saturday. By the weekend, the building was operational, though not fully finished. One crucial escalator wasn’t completely installed; another was in and out of service. A bartender for Cedric’s, the Shed’s not-yet-open restaurant by Danny Meyer’s Union Square Hospitality Group, apologetically handed out free bottles of water and said that it would probably be up and running by late April. But that didn’t stop thousands of visitors from passing through. “Reich Richter Pärt” drew a solemnly attentive audience. “Norma Jeane Baker of Troy” had a full house for its premiere. (A review of that is coming this week.) Part of Trisha Donnelly’s show was treated as an observation gallery; one man asked a Shed employee where the exhibition was, not knowing he was standing in the middle of it. Through April 14 in the McCourt. 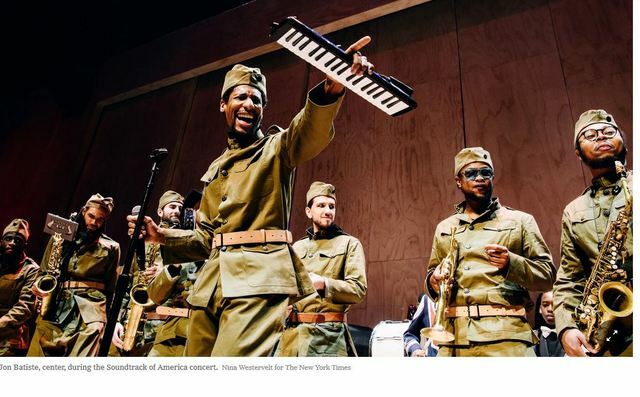 Thundering syncopation and a parade through the audience opened the first part of Soundtrack of America, a five-concert survey of African-American music. The McCourt was configured as a club, with a plywood stage, a dance floor, a D.J. and a seated aerie. Jon Batiste was leading the Howard University “Showtime” Marching Band, the Brooklyn United drumline and his own 369th Experience brass band. Their set commemorated James Reese Europe, a pioneer in bringing African-American music to concert halls — including Carnegie Hall in 1912 — and recordings. During World War I, he served in the segregated 369th Infantry Regiment, known as the Harlem Hellfighters, and directed its regimental band, which introduced ragtime across Europe. Mr. Batiste’s 369th Experience musicians wore military khakis. That’s the mission of Soundtrack of America, conceived by Steve McQueen as a joyful history lesson and advised by Quincy Jones and others. Dedicated to continuity and cultural memory, each concert features five musicians performing songs that inspired them, alongside their own music. Friday’s lineup included performers and songwriters (PJ Morton, Victory, Rapsody and Sheléa) backed by the keyboardist Greg Phillinganes leading a supremely adaptable band. They chose more recent, more familiar musical ancestors — less history, more hits — and were willing to risk having their songs compared with the pantheon. Mr. Morton, a keyboardist in Maroon 5, invoked both the two-fisted New Orleans piano tradition and Stevie Wonder, putting gospel flourishes into the Fats Domino hit “Blueberry Hill” and barreling through Mr. Wonder’s “Higher Ground” on the way to his own ballad, “First Began,” full of Wonder-like chord changes and vocal turns. 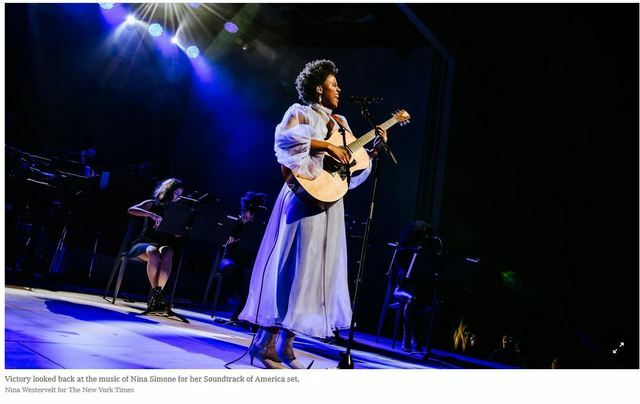 With her burnished, supple alto, Victory started “Feeling Good,” a Nina Simone showpiece, as a bluesy reflection, then shifted it toward the Caribbean lilt of her own songs calling for self-acceptance. Rapsody, a rapper from North Carolina, emphasized women’s power and self-determination. She declaimed her rhymes with decisive, leaping inflections, linking her material to Nina Simone, Queen Latifah, Lauryn Hill, Roberta Flack and (joined by Victory singing “Strange Fruit”) Billie Holiday. Sheléa juxtaposed her elegantly retro jazz ballad “Love Fell on Me” with crowd-pleasing homages to Sarah Vaughan, Whitney Houston and Aretha Franklin. Mr. Phillinganes and the band added their renditions of songs by Ray Charles, James Brown and Thelonious Monk. Through June 2 in the Level 2 Gallery. A few minutes after the audience has entered the first of two gallery spaces that make up “Reich Richter Pärt,” chanting begins. It turns out the singers, dressed in street clothes, have been embedded among us — a tired trick of contemporary performance. Members of the Choir of Trinity Wall Street sing, and repeat three times, “Drei Hirtenkinder aus Fátima,” a spirited piece in Arvo Pärt’s neo-Medieval style. When this collaboration between Pärt and the artist Gerhard Richter was new, in England in 2015, “Drei Hirtenkinder” was heard among Richter’s somber “Double Gray” diptychs and “Birkenau,” a series of abstractions concealing photographs of concentration-camp prisoners. Perhaps a little heavy for the Shed’s opening festivities? Now, amid the cheerful commerce of Hudson Yards, the only history being reflected upon is that of the artists’ collaboration itself. “The History of ‘Reich Richter Pärt,’” the program screams in inch-high capital letters, endowing with epochal import a 50-minute interplay among three octogenarian cultural celebrities. The adjacent room is wrapped in more wallpaper: panoramic pieces printed with the final stage of Richter’s “Patterns,” a 2012 book project that halved and mirrored an earlier abstract painting, over and over, into ever-thinner strips that eventually resolve into long, horizontal bands of color. 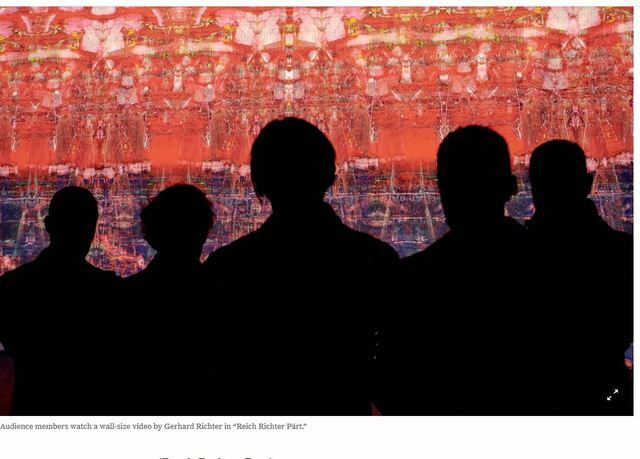 A film, by Mr. Richter and Corinna Belz, depicts the “Patterns” process, then its reversal, to the live accompaniment of a new score by Steve Reich, played on Saturday by Ensemble Signal, that also undergoes a symmetrical process-based transformation. (The International Contemporary Ensemble will fill in for some performances in the eight-week, four-times-daily run; the Brooklyn Youth Chorus similarly shares the workload for the Pärt.) A two-note motif builds to complex, rhythmically agile brightness, then gradually recedes back into blur as we watch Richter’s bands seem to rush by at light speed, fervently oscillating, at the finale. Through May 30 in the Level 4 Gallery. In choosing the American artist Trisha Donnelly for the Shed’s first solo exhibition, the curators here opted for a tactician and a troublemaker — one whose terse, enigmatic maneuvers stand far from the sparkle and retail of Hudson Yards. Ms. Donnelly’s page in the Shed’s brochure for its first season is blank. Her show, alone among the inaugural offerings, is not signposted beside the half-finished escalators. And she has bridled against the building’s architecture, forcing spectators through the side entrance of the new gallery into a half-lit space that some will confuse for the back of house. You wanted an artist who’d push the boundaries of the new institution? Be careful what you ask for. Inscrutability, provisionality, self-effacement: These are the contrivances of Ms. Donnelly, whose untitled exhibition is the only project here that puts the Shed itself in question. In the dim gallery you will see segments of two massive tree trunks, a redwood and a pine, lying like cadavers on simple dollies. Water puddles beneath them (these trees, though blasted, are still alive), and their amputated branches have been dressed with white plastic foam bundles that appear like tourniquets. Dozens of smaller branches, many also bandaged, balance in a corner. A sound system positioned on a dolly as its own sculpture roars a single aria on loop: the Habanera from “Carmen,” sung by Leontyne Price and rattling the speakers. The blaring Bizet, extolling love as “the child of the bohemian,” and the bandaged trees, recalling mutilated soldiers, suggest joys and pains that have no place in Hudson Yards. Yet how these elements inform one another, as easy opposites of nature and culture or of life and death, is less important than whether they together can conjure an atmosphere of whispers, diversions, mistakes, vanishings. When the art world was smaller, Ms. Donnelly’s evanescent, undocumented interventions — most famously, a 2002 performance in which she rode into a gallery on horseback, proclaimed a military surrender, then galloped back out — had the thrill of a runaway rumor. 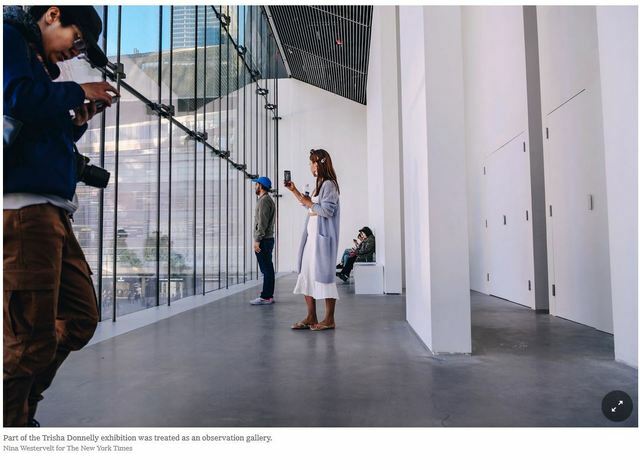 Today, when every exhibition is Instagrammed and hashtagged, that effect has become almost impossible to realize, which Ms. Donnelly has surely acknowledged by leaving a narrow gap in the wall built to block the windows. At the hour I visited, the light passing through it cast a faint camera-obscura gleam of the soon-to-open Equinox Hotel.